What would you do if someone gave this to you to drink? What if you knew that they eat gerbils and hamsters here? Anyway, I was a little aprehensive. It turns out that the drink is quite tasty. And that thing at the bottom? 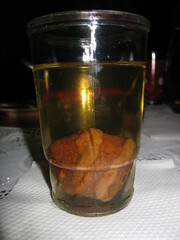 A dehydrated peach. Ahh, gastrointestinal disaster averted! And, I asked my family: although Bolivians eat gerbils and hamsters, they do not. Bonus!